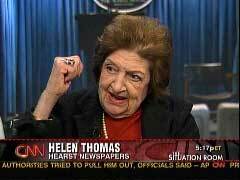 After serving in the White House Press Corps for 57 years, Helen Thomas retired on June 7, 2010. The abrupt end of her career came in the wake of a viral video showing her telling Israeli Jews to "get the hell out of Palestine' and "go home" to Germany. Thomas has not been shy about expressing her left-wing views and reliably anti-Israel opinions since she became a White House 'columnist' in 2000, after a lengthy career as UPI's straight news White House correspondent. 'I censored myself for 50 years....Now I wake up and ask myself, 'Who do I hate today?'' she boasted in 2002. But a review shows Thomas was expressing solidly liberal opinions even as a supposedly neutral reporter. — UPI White House reporter Helen Thomas talking about Ronald Reagan on CBS News Nightwatch, December 30, 1988. — UPI White House correspondent Helen Thomas on C-SPAN's Journalists Roundtable, December 31, 1993. — Exchange during Bush's first presidential news conference, February 22, 2001. — Hearst White House correspondent Helen Thomas questioning White House press secretary Ari Fleischer at Dec. 5, 2001 briefing shown live on cable news channels. — Hearst columnist Helen Thomas speaking at a March 3, 2002 Newseum session shown by C-SPAN on March 4, 2002. — Helen Thomas's question to White House press secretary Ari Fleischer, April 1, 2002. — Hearst White House columnist Helen Thomas on MSNBC's Donahue, July 22, 2002. — Hearst White House columnist Helen Thomas speaking at the Massachusetts Institute of Technology (MIT) on November 4, 2002 and quoted on MIT's Web site two days later. Why Does Bush Bomb Innocent Iraqis? — Thomas to press secretary Ari Fleischer during a January 6, 2003 White House briefing shown on all three cable news networks. — Hearst White House columnist Helen Thomas at a Society for Professional Journalism banquet, as quoted by the Torrance, California Daily Breeze's John Bogert in a January 19, 2003 story. — Hearst White House columnist Helen Thomas, as quoted in the 'Under the Dome' column by Albert Eisele and Jeff Dufour in The Hill newspaper, July 28, 2005. — Former UPI White House reporter Helen Thomas in a Q&A with the liberal Center for American Progress and posted on the group's Web site February 28, 2006. — Longtime UPI White House reporter Helen Thomas, now a columnist for Hearst newspapers, in a Q&A published in the Philadelphia Inquirer, November 5, 2006. — Former UPI White House correspondent Helen Thomas on CNBC's Tim Russert, June 9, 2007. — Helen Thomas explaining why she voted for Obama in an interview with Cox Newspaper reporter Ken Herman posted November 12, 2008 on the Fishbowl DC blog. What's 'Real Excuse' for Afghan War — and No Bushisms!